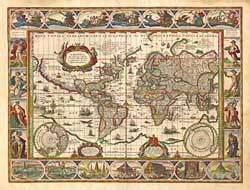 Willem Janszoon Blaeu (1571-1638) founded one of history's greatest cartographic publishing firms in 1599. Using skills learned from the celebrated Danish astronomer Tycho Brahe, Blaeu set up shop in Amsterdam as a globe and scientific instrument maker. He soon expanded the business to include map, chart and book publishing.